Whenever winter comes we load ourselves up on meaty, carb-y goodness. We crave soups and warm food, pasta, casseroles, pies and roasts. Most of the time, we forget about salads. That’s not so much a problem if we eat lots of vegetables with these roasts and soups. For me, I still need to eat a salad here and there. It might be a mental thing more than anything. I need that cleansing feeling more than anything. I made this salad a few times over summer and have been meaning to post it. But being me, it was filed and forgotten. 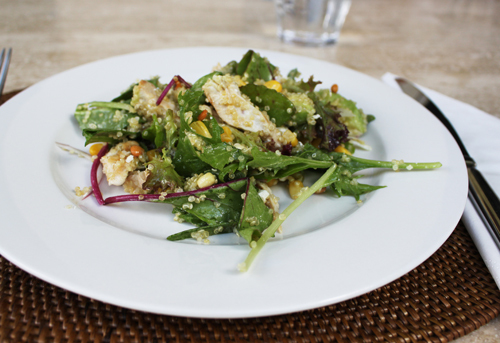 I made it again last week, and although aspects of the salad constantly change based on what ingredients I have on hand, the concept stays the same – quinoa, chicken and corn. I’m trying to eat more quinoa these days as I know that my wheat intake is a little too high. I am half Italian after all, so avoiding it is hard. Being winter, it’s also hard to bring myself to eat salad when all I want it hot food. But, I always feel good after eating this and never regret my decision. A couple of extra notes. I think in this salad (images) I used mixed sprouts instead of pine nuts. Mixed sprouts are so good for you, but I can’t pass up toasted pine nuts when I have them at home. Also, try and grill the corn if you can – it adds the most intense smoky flavour which I think makes the salad. I used this dressing for the salad, but a simple olive oil and red vinaigrette works great too. Place ½ cup of washed quinoa and 1 cup of water in a small saucepan. Add the ½ stock cube and bring to the boil. When boiled, reduce to a simmer and allow the quinoa to cook and absorb all the water. 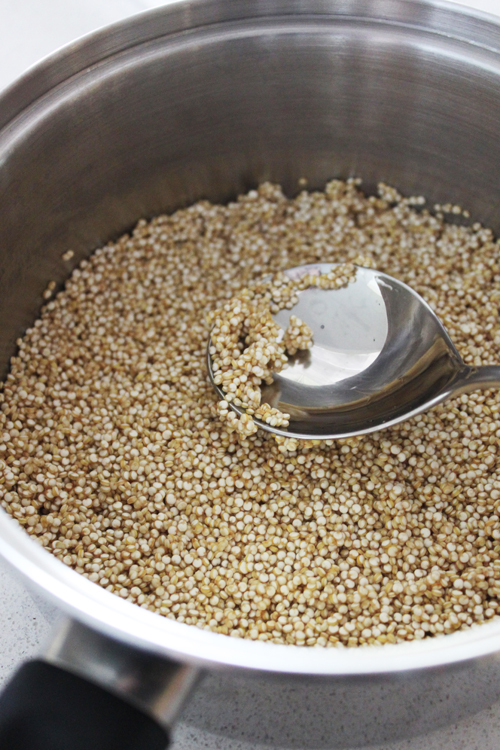 When done, drain the quinoa, gently run a little water over it and allow it to cool in a sieve. Set aside. Cut off any excess fat on the chicken, rub a little salt and olive oil on it and set aside. Rub a little olive oil on the corncobs and place on a hot griddle (or fry pan). Turn occasionally until the cobs have nice grill marks. Place them in a bowl, cover with plastic wrap and set aside. The plastic wrap allows them to continue cooking and soften the kernels. Place the chicken on the same grill pan and cook on each side for 10 or so minutes. When cooked, set aside to cool. Remove the corn kernels from the cob by running s sharp knife down the side of the cob from top to bottom. Turn the cob and repeat until all kernels are removed. Slice the chicken up (or shred if you prefer). Place the lettuce in a big bowl. 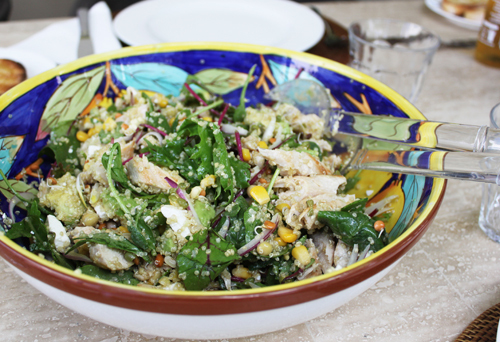 Scatter over the cooled quinoa, chicken, corn, toasted pine nuts and avocado. Crumble over the feta, and pour over your salad dressing. I recommend this one. That looks delicious. I'm with you, trying to increase my winter salad intake. Serving it while the chicken is still warm would work well for me in this cooool weather. The unpredictable mix is charming. Love to try this. I am more of a salad girl during the summer months to keep me refreshed. Thanks for sharing the recipe. I am a huge salad fan, and this looks like one that is going on my "to taste" list. So fresh, yet hearty. This looks delicious! Reminds me to use up some of my quinoa in the pantry! 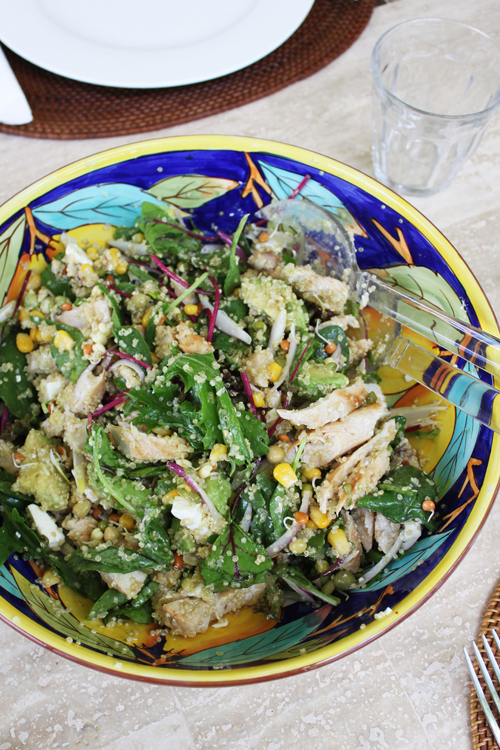 I make a yummy salad with quinoa in summer with green beans, peas, fetta, chicken and lots of herbs and lemony dressing!